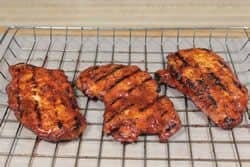 This smoked grilled chicken breast is just one example of how you can successfully smoke meat on the grill. 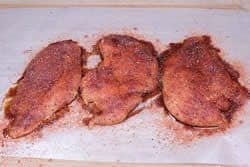 With a few simple steps you can cook this chicken breast and almost any other kind of meat indirectly on the grill by manipulating the burners or by moving the coal into zones. If you want to speed things up, you can then finish it off right over the flames once it's smoked for about 45 minutes. 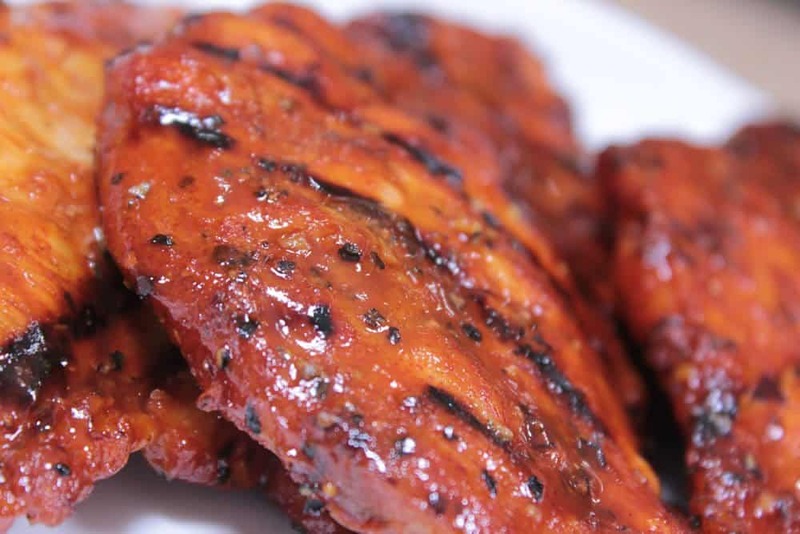 Have you heard everyone raving about how great my naked rib rub recipe is on chicken? Well, it's true and you have to experience it for yourself to get the full impact! When you order, I'll also give you my Texas style rub recipe for free. Just don't overdo it. Like so many things, a little goes a long way. 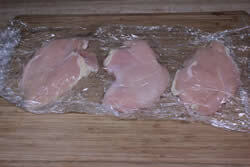 If you choose to do this, lay the chicken on a piece of plastic wrap then cover it with another piece of plastic wrap. This is to keep the mess to a minimum. This is the easy part, simply brush or spoon a little olive oil onto the chicken breasts and sprinkle a generous amount of Jeff's Rub (purchase recipes here) onto the top and bottom of the chicken breasts. 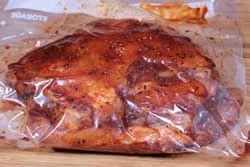 Once seasoned, place the chicken breasts into a ziptop bag, press out the air and place the bag into the fridge overnight or for at least 4 hours. 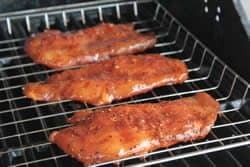 After 4 hours or the next morning, remove the chicken breasts from the fridge and place them on a Bradley rack or cookie sheet to make it easy to transport them out to the grill or smoker. 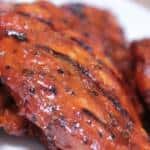 The main purpose for doing these on the grill is to show you that it can easily be done if you don't have a smoker or if you just want to use the grill instead of the smoker to get them done fast and easy. I am using a 4-burner infrared propane grill which simply means, the propane burners are heating another surface which is then emitting that heat onto the meat. In the case of my grill, just below the grates and above the burners are 2 cast iron pans. The flame heats these pans and the heat is then emitted very evenly onto the grate above. I like to place wood pellets down in the pans for some smoking action and since we are using the grill as our smoker, this just seems like an especially great thing to do. 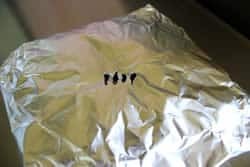 If your grill does not have the infrared pans, you can simply wrap dry wood such as chips, pellets, chunks in foil with just a few holes poked in it to allow the smoke to escape. This foil packet can be placed right over a flame to create smoke while you are cooking. You will have to play around with the heat and use an oven thermometer or a meat thermometer with an ambient probe to figure out what setting is required to maintain 225 °F at the grate where the meat is sitting. I don't recommend relying on the thermometer in the grill lid as they are known for being very inaccurate. On my 4-burner infrared gas grill, I opted to light the 2 leftmost burners and leave the two burners on the right unlit. I found that the two burners set at about the 6 o'clock position held a very tight 225°F. For a charcoal grill, you use the same basic concept, using charcoal. Place an aluminum pan in the center of the grill filled with water. Pile the charcoal on both sides to create hot zones on the sides with a cooler center. You can also just pile all of the charcoal on one side of the grill with a water pan on the other side and get the same effect. 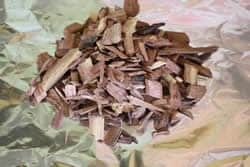 Place wood chunks on the charcoal or very near the charcoal to get some smoking action. The idea in this recipe is to use the grill as instructed above but you can also just use the smoker if you wish. I do recommend finishing on the grill even if you choose to start out on the smoker. 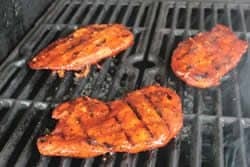 The slight charring on the outside of the chicken breasts look great and it gives a slightly different product than what you get by just using the smoker alone. 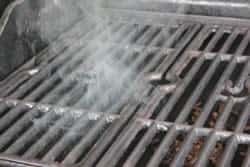 Whether grill or smoker, set it up to maintain about 225°F. Place the chicken breasts on the cool side of the grill for about 45 minutes or until they reach about 125°F. Keep the smoke going for the entire time to ensure great smoked flavor. Let the sauce set for a minute or two then move the chicken to the hot side and crank up the heat to high. Cook the chicken for about 7 minutes on each side to finish. Place the chicken in the smoker by leaving it on the Bradley rack or by laying it directly on the smoker grate. Smoke the chicken for about 1.5 hours (depending on thickness) or until it reaches 165°F. About 20 minutes before it gets finished, brush some beer bbq sauce (recipe above) onto both sides of the chicken. Makes a great grilled chicken sandwich! Amazing rub and sauce recipes!!! I've used the rub on both chicken and pork to everyone's satisfaction. My wife and children say it was the best chicken I've ever cooked on my Big Green Egg. Keep'em coming Jeff. You are the rub and sauce master. ~Rob C.
Amazing recipes just wondering why I waited so long!!!!! ~Rodney W.
Love the original rib rub and sauce! We have an annual rib fest competition at the lake every 4th of July. I will say we have won a great percent of the time over the past 15 years so we are not novices by any means. However, we didn't win last year and had to step up our game! We used Jeff's rub and sauce (sauce on the side) and it was a landslide win for us this year! Thanks Jeff for the great recipes. I'm looking forward to trying the Texas style rub in the near future! ~Michelle M.
Get Your Own Copy of my Book Today! With more than 590 reviews on Amazon.com and a rating of 4.7 out of 5 stars, it comes highly recommended. It is also listed as a #1 Bestseller in Barbecueing & Grilling books on Amazon. We get a small commission on everything you purchase at Amazon.com when you use our special link. You can shop for smokers, grills, tools, clothing, gifts, non-perishable food items, jewelry, electronics, books and so much more. It's a really great way to say thank you and to support what we do to promote smoking meat. Lay the chicken on a piece of plastic wrap then cover it with another piece of plastic wrap. This is to keep the mess to a minimum. Use a meat hammer or other heavy object to pound the chicken breast a little bit. Brush or spoon a little olive oil onto the chicken breasts and sprinkle a generous amount of Jeff’s Rub onto the top and bottom of the chicken breasts. Place wood chips or chunks wrapped in foil over the flame to create smoke. Maintain 225°F by manipulating the setting of the burners on the hot side. Place the chicken breasts on the cool side of the grill for about 45 minutes or until they reach about 125°F. Keep the smoke going for the entire time to ensure great smoked flavor. After 45 minutes or 125°F move the chicken breast to the hot side of the grill. Turn the grill to high heat and cook for an additional 7 minutes on each side or until the chicken reaches 165 °F in the center as measured by a meat thermometer. For a charcoal grill, you use the same basic concept, using charcoal. 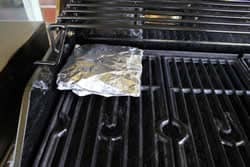 Place an aluminum pan in the center of the grill filled with water. Pile the charcoal on both sides to create hot zones on the sides with a cooler center. You can also just pile all of the charcoal on one side of the grill with a water pan on the other side and get the same effect. Lay wood chunks on the charcoal or very near the charcoal to get some smoking action. Place the chicken breasts on the cool zone of the grill for about 45 minutes or until they reach about 125°F. After 45 minutes or 125°F move the chicken breast to the hot zone of the charcoal grill. Cook for an additional 5-7 minutes on each side or until the chicken reaches 165 °F in the center as measured by a meat thermometer. 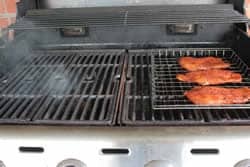 Place the chicken breasts directly on the smoker grate. does your book come with all your rub and sauce recipes inside? I do offer a coupon to book owners for 20% off the purchase of the recipes. Simply send proof of purchase (amazon invoice, picture of you holding the book, etc.) via email and I will send you the coupon code. I am obsessed with your website! I have purchased your recipes and your book(Nook version) I look forward to your newsletters and subject my family to your recipes on a weekly basis! EVERY recipe is a huge hit! I’m going to have to add on to my kitchen just to have room for your sauces and rubs! Thank you for making me a better BBQ chef and helping me to perfect my smoking techniques!